Furosemide, marketed under the brand name Lasix, usually is prescribed for dogs diagnosed with congestive heart failure or fluid in the lungs. Lasix is a diuretic, removing excess fluid from the body. While the drug is generally safe when used as directed, some dogs can experience side effects. Since it's likely your dog is already seriously ill if taking Lasix, call your vet immediately if your pet experiences any side effects. Vets prescribe Lasix more often than any other diuretic. It works by preventing the body from absorbing potassium, sodium and chloride. While generally prescribed in tablet form, Lasix may be given intravenously or via injection for dogs requiring immediate therapy. In addition to pulmonary edema or heart failure, your vet might prescribe Lasix if your dog exhibits signs of a phantom pregnancy, especially lactation. The medication helps get rid of excess fluid resulting in "milk," helping to alleviate the condition. Lasix will make your dog thirsty, so even though it gets rid of fluid, your dog will probably drink and urinate more than usual. This side effect is expected and your vet will advise you about it. 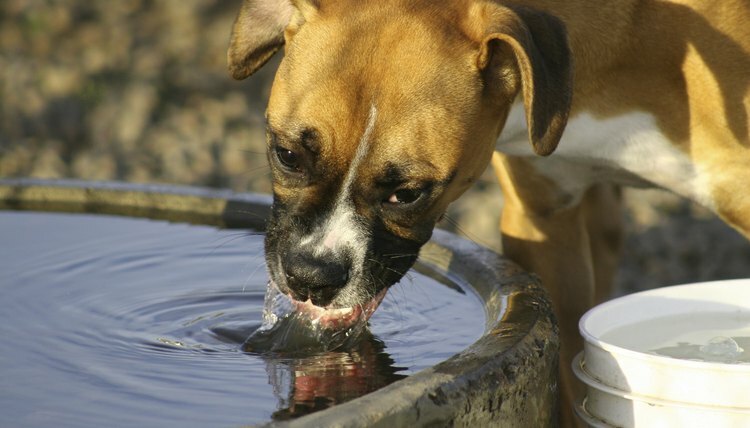 Call your vet if your dog is drinking truly excessive amounts of water. Your dog's blood sugar levels likely will increase, but that isn't usually a problem unless the animal is borderline diabetic. Lasix is generally prescribed for twice daily use. Expect your dog to urinate within a half hour after receiving the drug -- plan your schedule accordingly. Call your vet if your dog experiences breathing difficulties or facial swelling after receiving Lasix, as that could be signs of an allergic reaction. If your dog receives high doses of Lasix, perhaps from getting into the medication or because of veterinary miscalculation, he could lose too much fluid. That might result in electrolyte imbalances or other issues. Signs of electrolyte imbalance include gastrointestinal problems, rapid heartbeat, low urine output or either lethargy or restlessness. In a worst case scenario, your dog might collapse, suffering from a blood clot or embolism. When your dog first begins the drug, watch him carefully for any signs of electrolyte imbalance. While cats have experienced hearing loss when given high doses of Lasix, it isn't clear whether the drug has this potential effect on canines. Dogs suffering from kidney disease or diabetes shouldn't receive Lasix. Nor should a dehydrated animal. Pregnant or nursing dogs should not take this medication. Tell you vet about any other medications or supplements your dog receives. Lasix is contraindicated in dogs receiving corticosteroids. If your dog has ever had urinary bladder stones, specifically calcium oxalate stones, the increase in calcium caused by Lasix administration could again cause stone formation. What Happens When a Horse Gets Colic?